Like many kids, I was known to stick black olives on my fingertips at holiday gatherings, joyously waving my hands until I popped them into my mouth one by one. I loved the way the olives transformed my hands into a cartoon character’s, and the way their juicy, salty burst of flavor sang of a special occasion. Decades later, after growing to enjoy a rainbow of olives — stuffed and cured in a variety of ways — I still find myself warmed by the sweet subtexts that plain old black olives bring. But when I recently ended up with a can of chopped black olives, I admit I took one bite and was reminded of how plain they taste compared to the colorful olives of adulthood. Sure, they are moist and salty–but not too flavorful otherwise. Don’t get me wrong, though: this realization was an exciting one for me. Mild, moist and a little bit salty? Those are a few perfect attributes for a cake ingredient. And since Jerusalem artichokes and green peas had proven to make delicious desserts, certainly black olives deserved a chance. 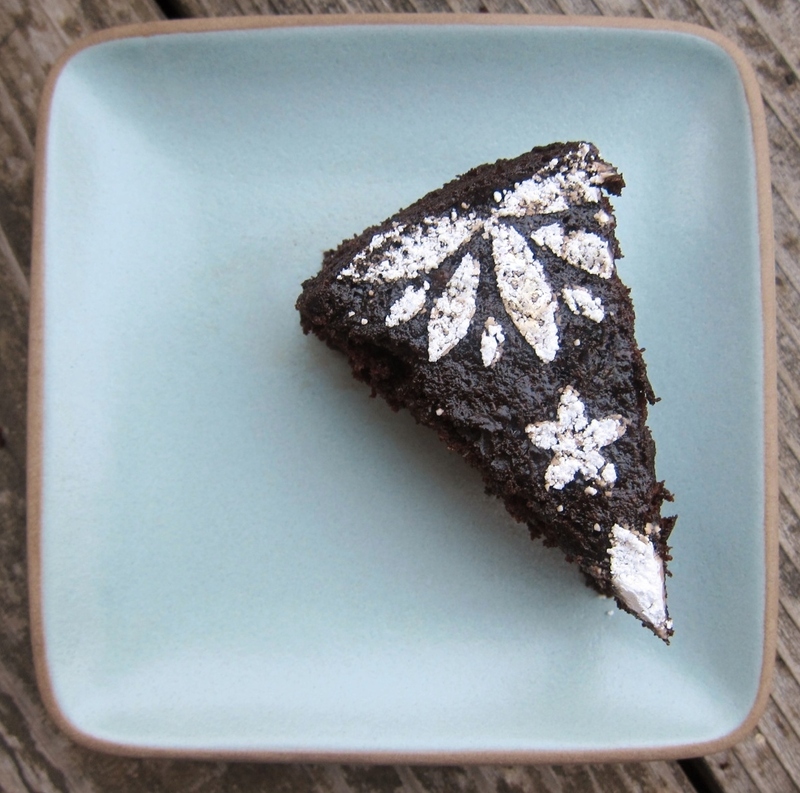 I decided on a black-on-black batter: dark cocoa and black coffee to mingle with the tiny bits of olives, plus a tad of butter, flour and sugar. A heap of orange zest would add a citrusy tang, and a good dose of vanilla would soften it all. The result was just as I’d hoped: a spongy, moist and deep-dark dessert enjoyed by many. Here is the recipe. 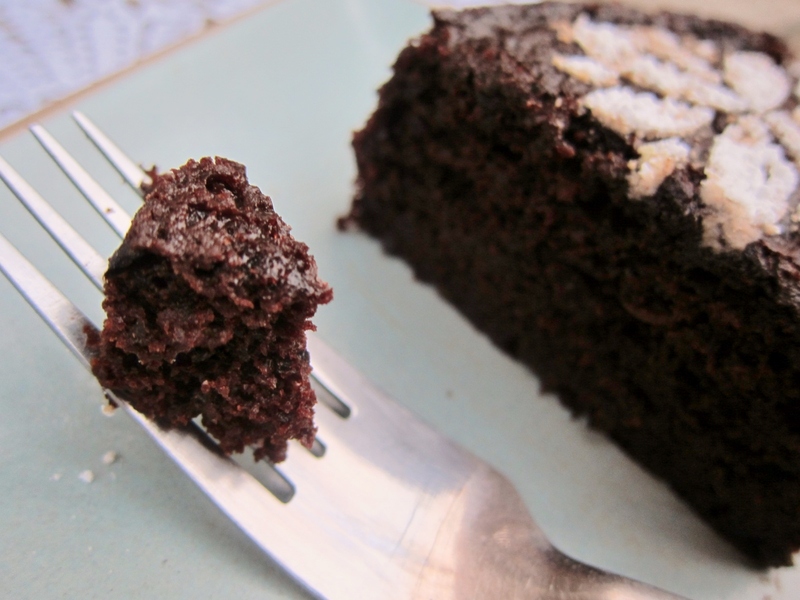 With its hidden flecks of orange and black olive, this rich chocolate cake is a crowd-pleasing treat which satisfies with an almost brownie-like crumb. When I shared it with a group at work and asked them to guess the secret ingredient, I heard “liqueur,” “melted chocolate” and “vanilla beans”; no one guessed olives, and hardly anyone could believe they were there. A cinch to whip up, this cake is a nod to those olives-on-fingertips days of youth, delivering simplicity and sweetness in one scrumptious form — all ages welcome. 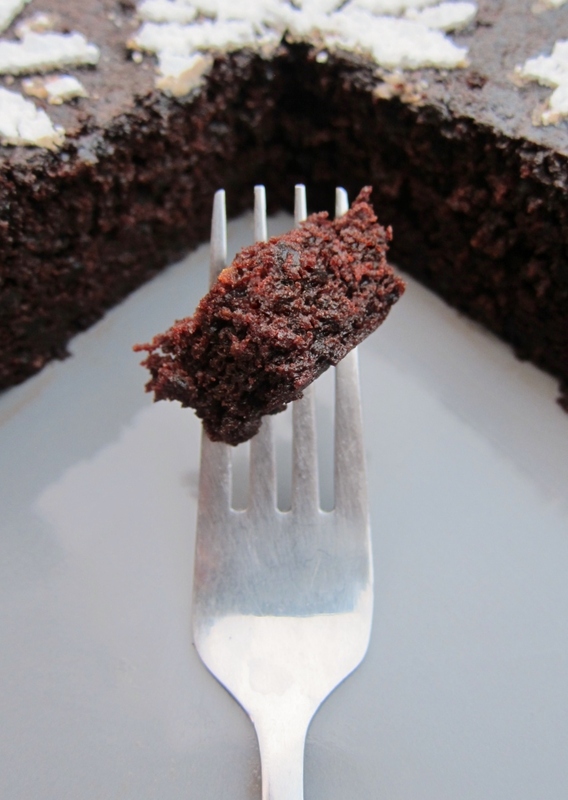 Maybe next time… This is truly an all-around versatile chocolate cake. Serve it with vanilla bean ice cream for a decadent dessert. Double the recipe, bake in two pans, and add your favorite frosting for a traditional layer cake. 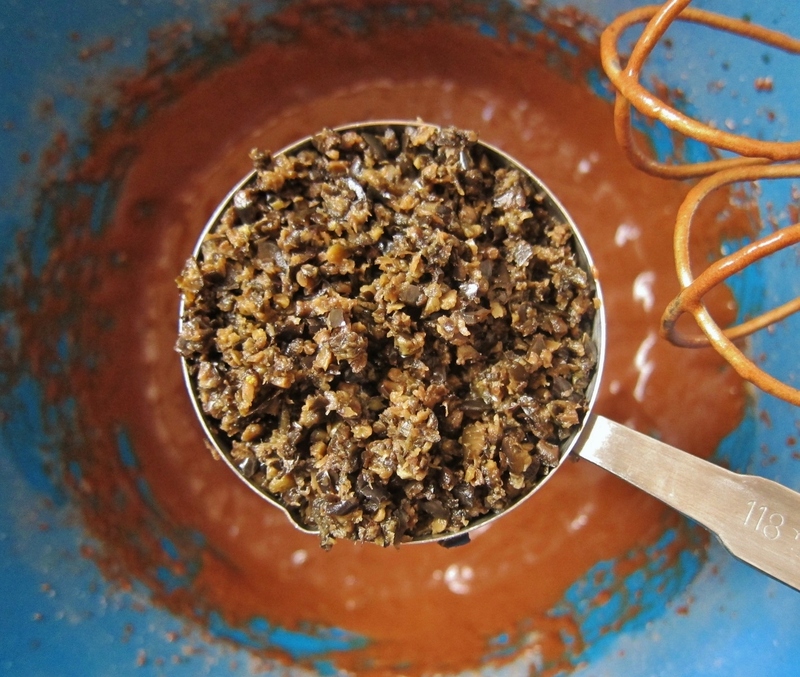 For a rich, chocolatey crunch, toss some cacao nibs into the batter. For a crisp citrus glaze, juice the zested orange, whisk a few teaspoons into a cup of powdered sugar, drizzle over the cooled cake and let dry. This entry was posted in Baking with Veggies, Cakes & Cupcakes, Sweets, Traditional with a Twist and tagged baking, baking with vegetables, black dessert, black olives, black-on-black, chocolate olive cake, cocoa, cocoa powder, dessert, food, halloween, moist chocolate cake, olive, olives, orange, orange chocolate, orange chocolate cake, orange zest, recipe. Bookmark the permalink. 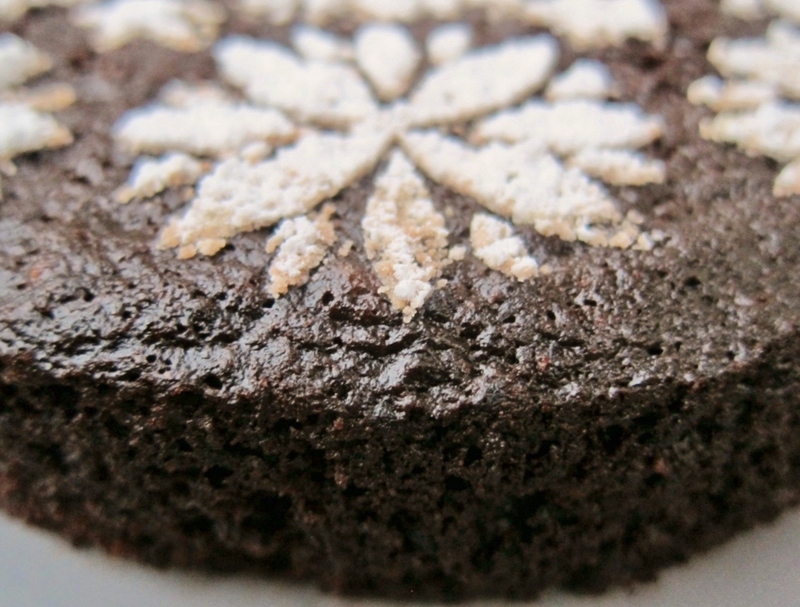 Just discovered your blog today and I’d love to make this and some of your other recipes. Thanks. Thanks so much for stopping by! If you end up making this or other recipes, I’d love to hear about it. Please do keep in touch. Thanks again, and happy baking! Is it at all possible to prepare the olive cake in a bunds pan? Hi Lorraine, Thanks for stopping by! I love the way you think; this cake would look lovely as a bundt. I haven’t tried making this in a bundt pan yet, but my hunch is that it might not be the best format: as is, the cake is really tender, and the recipe is pretty small for your average bundt pan. That said, I might try it in a bundt as a double or 1.5X version of the recipe, perhaps with an extra egg for structure. If I try it, I’ll update you; if you try it, I’d love to hear how it went! Thanks again. Thank you so much. I feel the same way about olives, and the same way about you! I’m laughing to myself because I did the same thing when I was a kid w/the olives. You continue to amaze me with your creativity & use of ingredients that no one would ever think to use. that cake looks so moist and delicious but I really love the decorating on top – very pretty. Thanks so much, Diane. 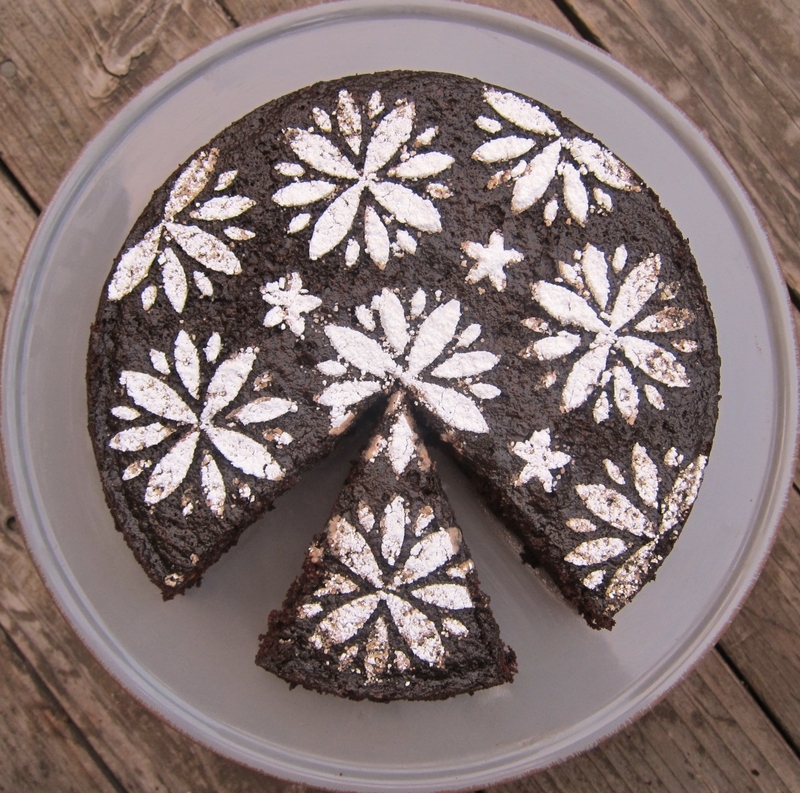 The decorating on the top is sort of cheating: they’re pre-cut cake stencils I found somewhere. 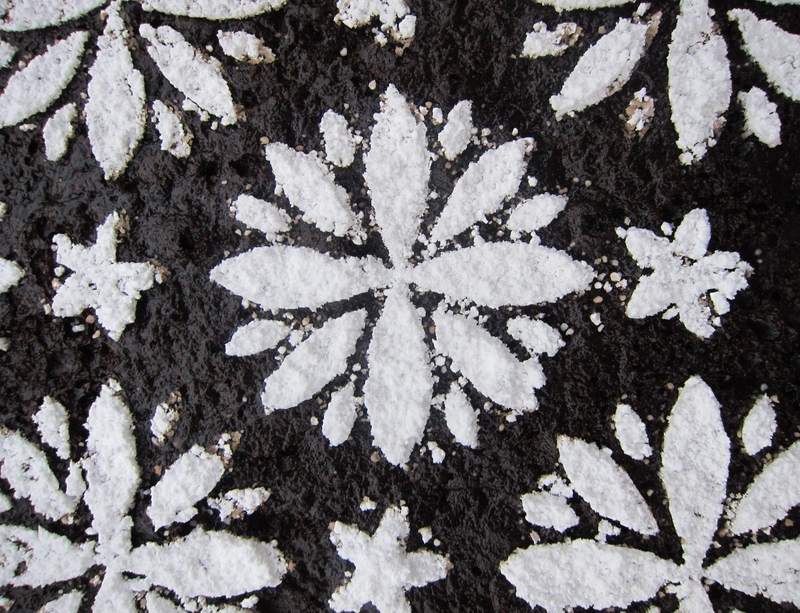 A dusting of powdered sugar is the easiest decoration ever! How cool is that! May I steal your idea? Thanks so much, Carl. Your kind words mean a lot to me, as they come from such a brilliant, creative, sweet person. You are always invited to visit the office; I’ll do my best to contact you when I bring a treat! This cake looks so amazing! It looks beautifully moist. I absolutely love olives as well so this looks like a fun recipe I must try. Thanks for sharing! Thank you, Lilly Sue! It was really moist, thanks to the olives. If you try it, I hope you truly enjoy it! These are such gorgeous and lush photos; I especially love the patterned powdered sugar on top of the cake! As for turning canned black olives into a delectable cake, I tip my hat to you. Thanks so much, Katy. 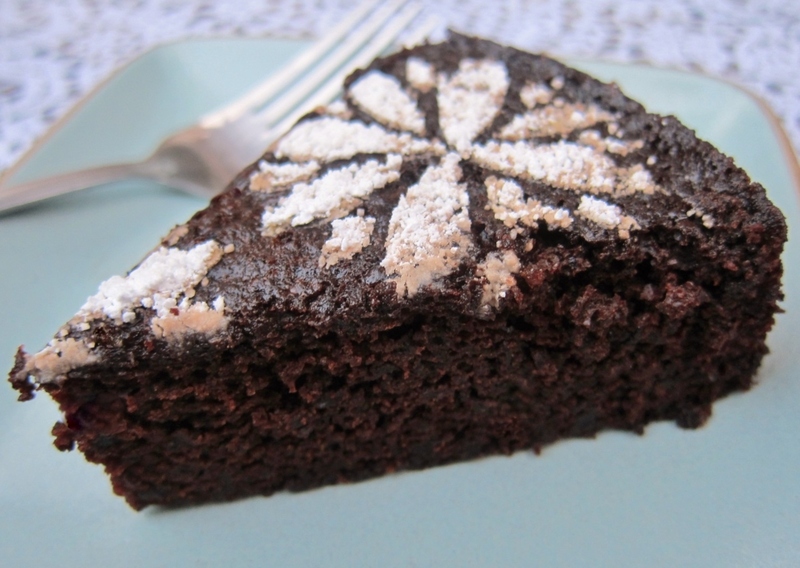 Your photos are so gorgeous — your compliment means a lot to me.� I promise, this cake just tastes like a good chocolate dessert: no hint of olives, except that they make it moist and replace the salt that would normally go in the recipe. Looks amazing – really clever idea. what a unique and lovely idea- presents beautifully too!